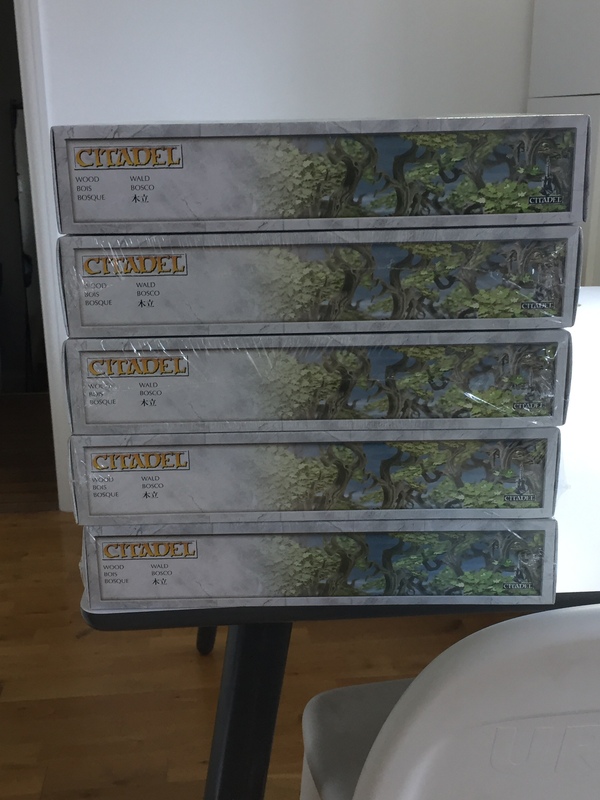 Chapel warband update – Exodite Avengers Assemble!! I may tweak these a little bit more, time depending… I’m thinking of introducing some red ‘warpaint’ around the eyes for all five, and I’m seriously considering ditching the back-banner on the Exarch – the more I think of it, the less the banner makes sense for a woodsy, hunter type… :-/ What do you guys think?? In other news, I used the bank holiday to start tackling trees…. Sooo many trees!!! Anyway, that’s it for now folks! It’s going to be a boring few weeks of posts from here on in, with tree after tree after tree to paint. I’ll fit the rest of my warband in and around the forest, (though they are essentially trees as well). I had better get a shift on – it is only three more weeks until we are called to the Chapel! They look great man. I can imagine it wild be challenging using the restricted paint palette but they really do look cool and like a group. I love the teeth hanging from the weapons. They are very woodsy. I certainly won’t be bored seeing each tree. I love it. I’m so envious! I wish I could make it but I’ll be watching and reading everything to do with the Chapel. You are being too hard on yourself Alex, those are lovely. Conceptually the back banner is maybe a bit off, but if you like the look of it on the model then leave it. Maybe it folds away rapidly, Stargate helmet style when the exarch is on the prowl. They look great. As for the back banner, if you like the look of it keep it. 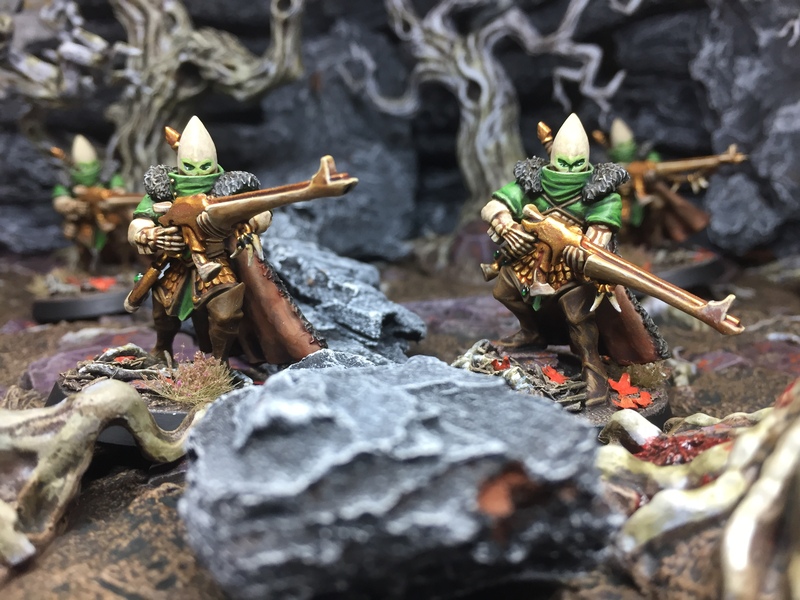 Despite the fact I am all for classic40k (obviously) I am personally not overall in favour of back banners, but on models where they look good, I have them. I am inconsistently consistent and you could be too. All of this is great, but the Watchers are an exceptional kind of creepy/awesome! Thanks man, I’m particularly chuffed with the watchers too – those doll’s heads are brilliant pieces! Love them (as expected). Some red markings would be interesting, either something “wood elf” or something like the markings used by the Tau. I say keep the back banner, it suits both the character and the setting, and he is an elf… no problems with moving his body to avoid snagging it on branches while he runs silently through the woods. Think you’re being a bit harsh on yourself regarding the Exodites, although I certainly know the feeling of having struggled with a model to the point of disliking the outcome – no matter how it looks. Personally I’d leave the warpaint in the bottle and be proud of them as they are, think adding the red might be overegging it a bit. As for the back banner I always had the idea that the whole point of it was that it was hard to run through the woods whilst wearing it. But whilst a clumsy Mon-keigh would get it snagged on something within about ten seconds a lithe and nimble Eldar could use it to demonstrate his agility and right to lead. So in-tune is he with the forest that he can also show the banner when he needs to rally his followers or, moments later, hide in ambush ever whilst wearing it. Just my thoughts though – if it bothers you, take it off! Love the Watchers – great concept! 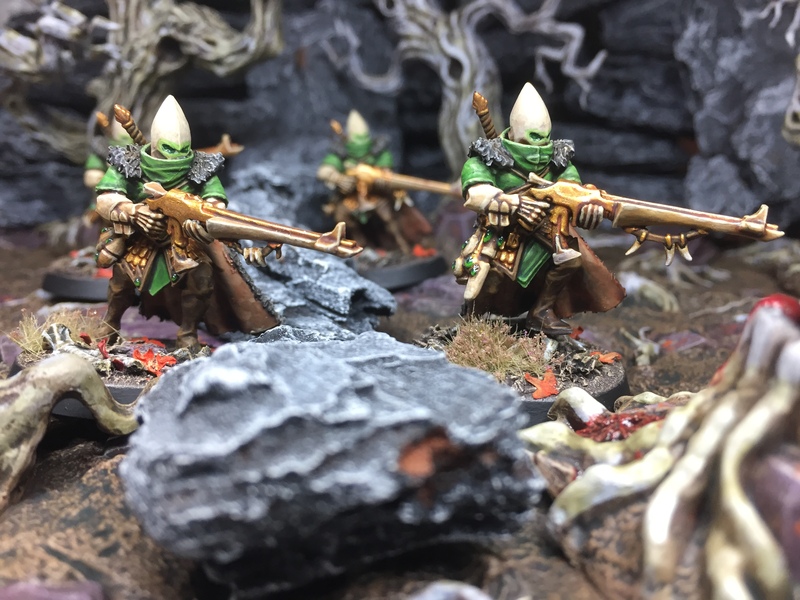 Aw, thanks man – yeah, it does take the gloss off a little when it is such a struggle to paint something, but I am still pleased with them :-) I’m not rushing any changes right now – gonna mull it over & see how I’m doing for time! :-) Thanks man, glad you like ’em! The colours do work quite nicely, don’t they? 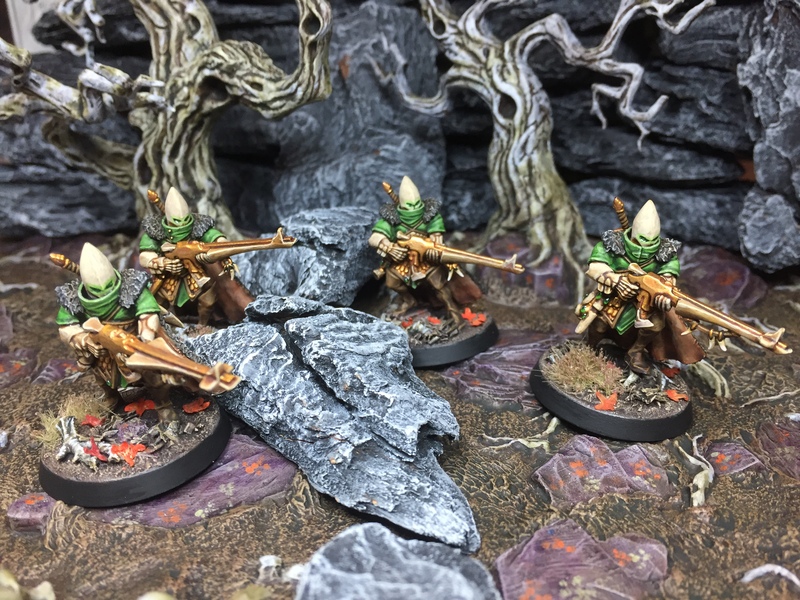 They look great – the paint job really ties them together nicely to give an Exodite vibe – recognisably Eldar, but distinct from the Craftworld/Dark Eldar aesthetics. Great work, I’m really liking this project. That wood elf style paintjob works wonderfully on the eldar as well. With the work you did on the back banner selling me on the idea, to my surprise I’m all for NOT ditching it. If you want a fluff explanation, you can just make one up. As said above, maybe it rapidly folds away or maybe he just attaches it when it’s time to go into battle? After all, it’s pretty much those moments you’ll be portraying and not the everyday forest slogging – there’s an interesting question here of whether the character always look like this or if you’re just capturing a snapshot. He most likely takes the back banner off when entering doorways, too. If you like the look, don’t let logic get too much in the way. I’m all for the rule of cool in most situations. They look really good. 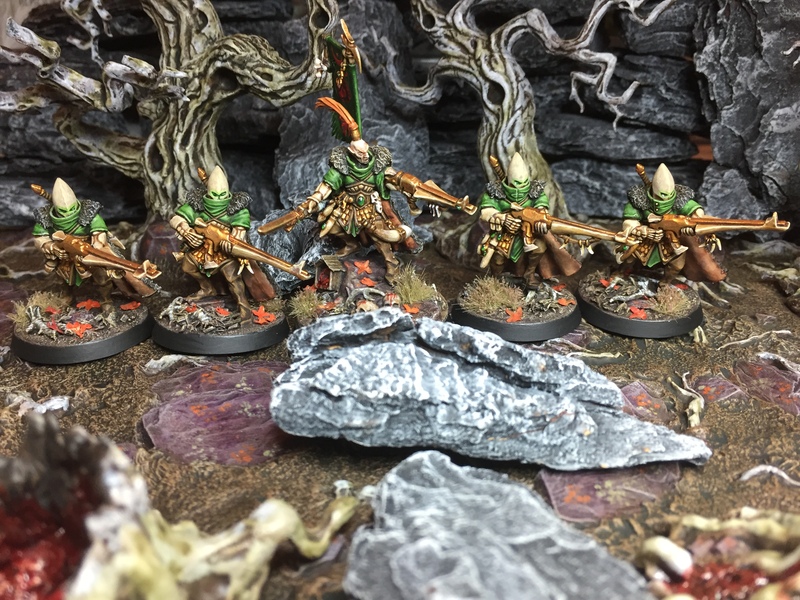 I like the little touch of the fallen autumnal leaves on their bases as well, and reflected on your terrain bases as well. I’d keep the banner, personally. If it’s only on the leader then it’s not excessive, and I’m sure it only comes out for open battle, as opposed to when they’re stealthing through the forests..
Marvellous work! The Exodites look very cool. I wouldn’t worry too much about the back banner, it’s 40k after all. And those faces in the woods. Yeah, creepy. I can imagine. The rest will just be assembly line painting I guess. 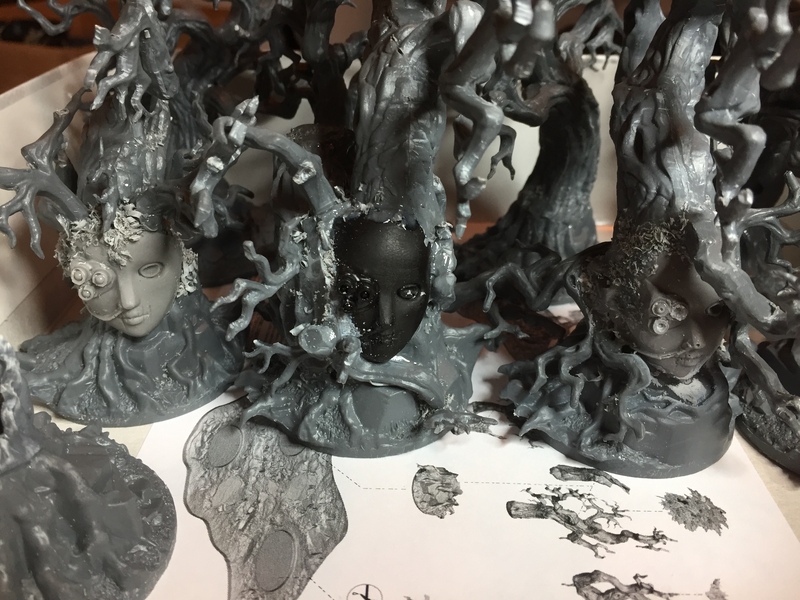 They look awesome mate and the trees are the right sort of creepy, Im glad you found a good use for the faces. It’s not long now and I’ll be working all hours I can to get it all done. Just wondering if you got the miniature ok? I tried to email but it bounced back. I kinda forgot I’d sent it haha so just wanted to check you’d got it ok. Cheers.